Mental health is hugely important in nursing. We’re not talking about a mental health nurses—though that’s a wonderful and necessary career—but nurses‘ mental health: How you psychologically manage your patients and tasks and long shifts and personal lives. The difference between good nurses and great nurses is rarely about skill. It’s about the thought process behind your skills, the ability to act instinctively, and the empathy with which you perform even rote tasks. Part of becoming a great nurse is done through higher education, but your mental health has a tremendous effect on your ability to think, act, and empathize. Wherever you are in your nursing career, you need to be aware of your mental health and how to make it a priority. Anyone who works in a career like nursing has to have a caregiver mindset, always looking out for others in need. It’s a wonderful quality, but it can be dangerous if your caretaking instincts come at the cost of your own mental health. There’s a saying in self-help psychology that you have to put the oxygen mask on yourself first. Of course, when it’s your job to (sometimes literally) put oxygen masks on others, this doesn’t always hold true for nurses, but it is important to remember that if you’re not taking care of yourself, you can’t care for anyone else. Especially outside of work, but even during shifts, mentally make an effort to consider yourself—your needs, your energy, your emotions. Nursing can feel psychologically relentless sometimes. In a single shift you can watch a patient die, have another patient’s family yell at you, and leave work to find your car has a flat tire. In every career people feel frustrated, stressed, and hurt, but as a nurse you may experience all of these emotions in a single hour, and often at a higher intensity level. Add occasional grief to the mix, and when you consider yourself you may find you’ve been pushed to your psychological limits. Nurses who don’t process their emotions—sometimes with family members but often with each other—resort to bottling them up, which is a surefire way of burning out in a few years. Your mental health depends on working through even painful emotions, so do. Separating your work life and personal life is vital to a nurse’s mental health. If you enter a rhythm of taking care of patients for 12 hours only to go home and take care of kids or your partner, only to leave to take care of patients again, you’ll become exhausted, even embittered—usually toward patients. You need to mentally separate the care you show patients and your loved ones, and post-shift rituals can help. Create a ritual for yourself to complete after every shift. It can be small: Brewing a kettle and sitting for 15 minutes with a cup of herbal tea. Or you may want to read, journal, or go for a walk around your block. Just choose something that calms you and is your personal, ritual. When it’s over, remember that the hours ahead of you are yours, and how you choose to spend them, and whom you choose to care for during them if your life, separate from your work. 4. Carve out some time for yourself. Beyond whatever ritual you create, look at your schedules and responsibilities and see how much time you have for yourself. Is it an hour a week? Five minutes every evening? Whatever time you have beyond work, sleep, chores, and personal responsibilities you should consider yours, and you should be able to carve out a little more of it. How much time do you spend on social networks every day? Or using other apps on your phone? Or watching television on Netflix? Whatever time you have for yourself, use it well with your mental health in mind. Sometimes that does mean catching up on a Netflix show you love—or catching up with a friend through Facebook messages! Just ensure you consider it your time, and try to fill it with activities that enrich your mind. Mental health has a physical component too. Namely: If your body’s not well, your mind won’t be optimal either. We can’t say it enough that nurses have to take care of themselves. Sleep, eat nutritiously, and exercise. Everything you would tell a patient, you should do yourself. It’s critical to your own well being, which includes your mental health. 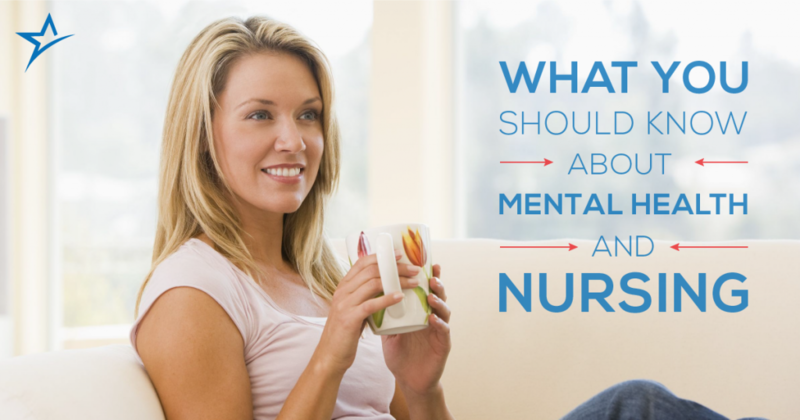 At Ameritech College of Healthcare we want to help our nurses be the best they can be, and maintaining proper mental health is a crucial part of that. To learn more about our curriculum, read here, and please reach out with any questions. We’d love to hear from you.